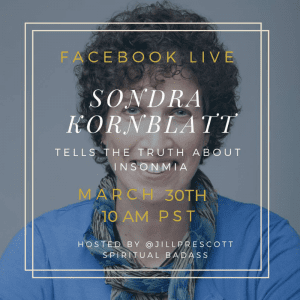 Jill Prescott, Spiritual Badass, is going to talk to me about the Truth of Insomnia — hope you can join us. Just click and follow this link, then “see first” to be notified when we go live. See you all on Facebook Live on Saturday March 30th at 10 AM PST!